J. – OK, we’re getting this thing started, and with a high ranking entry that neither of us had seen before. What little I read about this film before we watched it definitely intrigued me, but I was probably 3/4 certain it would ultimately bore me to tears. I don’t think I could have been more mistaken. It was genuinely exciting to watch this movie, which by all rights probably should have been incredibly banal. It really did focus on the stuff of everyday life without any attention to major events or remarkable scenery, but it was compiled in an utterly unique fashion. Who new it could be so exhilarating to watch trams go past? S. – I really enjoyed the interaction of the everyday people with the camera; while attempting to capture candid, ordinary scenes the presence of a bulky and noisy movie camera often seems to inject an element of festivity into events. The outcome is very uplifting despite the subject matter being intentionally mundane. J. – I agree, and that comes across particularly clearly in the great sequence at the office where people receive their marriage license and divorce papers. The camera was very much another player that the people had no choice but to react to. But I think that speaks generally to the aspect of the film which really elevated the whole thing for me: the fact that the movie is about making a movie. And not just any movie, the movie you are watching right now. By showing amazing footage and then footage of the amazing footage being shot, it injected the viewer right into the film-making process. But then to go even further by showing the film’s editor actively editing the movie you are currently watching; that was really unexpected and very effective as a storytelling technique in a film that claims to have no story. S. – I’m glad you mentioned the editing, serious props to Elizaveta Svilova for splicing this manic collection of faces and places together. I feel that there is a story here, regardless of intent; there are a number of reveals that occur and there is a balance in the vignettes that are shown: birth and death, marriage and divorce. While the narrative is not traditional there is a satisfying sense that what you saw all fitted together perfectly. Most certainly not the sensation I got from watching another of the list films that went sans-storyline (but that’s a rant for another day). J. – Very true, the thematic groupings kept things reasonably cohesive despite all of the rapid editing, and the pacing became a story of its own, particularly as it raced toward a sort of visual crescendo at the end. One of the things that really amazed me about this film were the number of techniques on display: slow motion, time-lapse photography, split screens, stop-motion animation, and numerous others. Some certainly represent the earliest instances I’ve ever seen (particularly the time lapse stuff, I had no idea that was around back then). 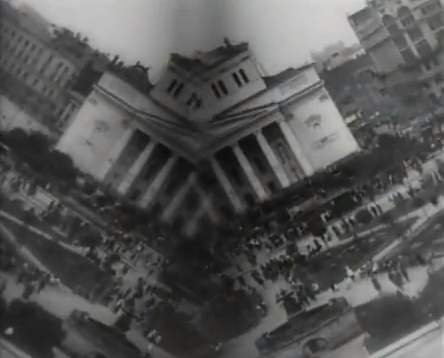 I was particularly taken with the shot of the scenery rolling up on itself; you know, a mere 80 years before Inception. But the trickery rarely felt gimmicky (OK, well the cameraman in the glass of beer was plain silly). Rather it served as a way to enliven and uplift the world around him — to make the mundane downright cinematic. A split screen image is manipulated to have a building fold up onto itself like a closing book. S. – I felt like the effects added to the sense of fun that was a common theme throughout the film. Being new to this silent movie business I also find that the soundtrack that goes along with it is very influential. The version we watched had a score by Michael Nyman that was a happy complement to the visuals (good choice, J. ), I am curious as to whether I would have found the film as enjoyable with a different accompaniment. J. – The score was excellent, and I’m sure had a significant role in what you mentioned in your first comment above: that this is an incredibly uplifting film. Considering that this film features a funeral, the homeless, and some pretty awful looking factory jobs, it brings a vitality to all of it that really just makes being alive seem well worth a good smile. I think we’re off to a good start!